We are gearing up for our fourth year anniversary on February 2, 2014. Before that, this week on January 30th, we are releasing a new episode, “A Step Between Stars” – it features Tim Russ reprising his role as Tuvok. Q, in his infinite wisdom, does not wish to have Tuvok steal his spotlight, and so he is once again holding a party on Earth Spacedock, Qo’noS and New Romulus Command (min. level 10; if Romulan, also have chosen an ally) at the same time. Captains can talk to him each day to help him with his party and receive Qmendations for their efforts. Q’s party will run from January 30th until February 27, 2014. 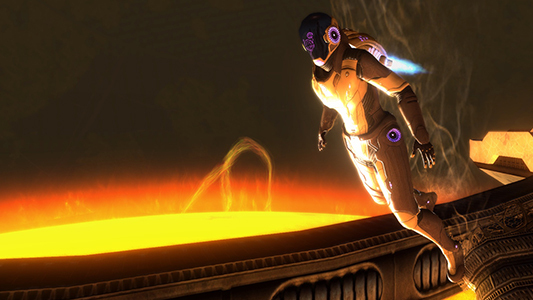 Afterwards, “A Step Between Stars” will only be accessible by level 50 Captains. Continuing the adventure players began in “Sphere of Influence,” this new episode has Star Trek: Voyager star Tim Russ reprising his role as Tuvok, who is now an Admiral. He and a team have been sent to a station over the sun in the Solanae Dyson Sphere to investigate shutting down a system that threatens to destroy warp travel as we know it. 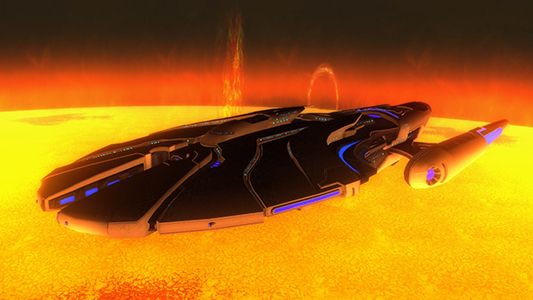 However, the Voth have attacked the station, leaving Tuvok and his team stranded and their mission in danger. 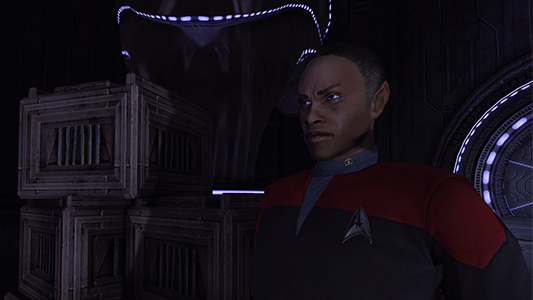 Captains level 10 and above can contact Subcommander Kaol via the in-game Mission Journal to discuss an operation to push back the Voth and support Tuvok in his mission. Captains will have to brave the dangers of flying over the surface of the sun to meet Admiral Tuvok and help him complete his mission. In addition, captains will get a chance to fly in one of the new Dyson Hybrid Ships that are being introduced for the first time. Captains will be rewarded with one of three unique pieces of ship equipment of your choosing (replay to get all 3! ), and additionally, on their first playthrough, 400 Qmendations! This will provide a great boost to the start of your Anniversary Event reputation project. As mentioned, Qmendations are going to be used for our anniversary event reputation system. Captains can help Q coordinate his party in a quick daily mission on Starfleet Academy or the Klingon Academy to earn 40 Qmendations. There are also other prizes available to earn during the event, including special EV Suits in the Feature Episode, which will be revealed in tomorrow’s Dev Blog. NOTE: Stepping through the portal at New Romulus Command (min level 10 and ally chosen) will transport Romulan Captains directly to the academy of your chosen allies. Upon completion of your daily mission, you can step back through when you are ready. Qmendations can be inputted into the special anniversary event reputation project that will reward you with a Dyson Science Destroyer from your character’s faction upon completion. More information about these ships, including stats and abilities, will be posted in a Dev Blog later in the week. We’re all excited to bring these events and new Feature Episode to our fans. We wouldn’t have made it these four years without you, and we can’t wait to show you more of what is in store this year! See you all on the sun!